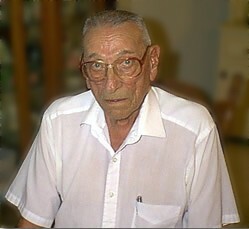 Sam McDaniel, a World War II Veteran, resides in Valliant, Oklahoma. Sam joined the 18th Artillery in 1938 and went on to see some of the more scenic parts of France and Belgium. 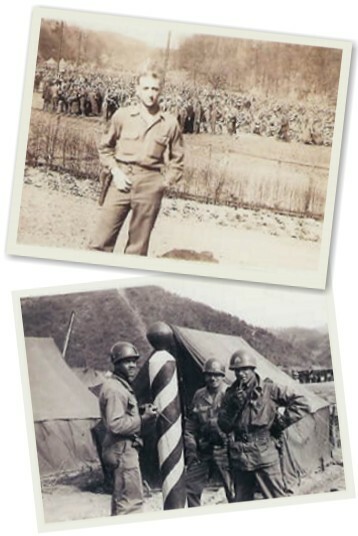 Sam participated in the D-Day invasion and entered France via Omaha Beach. He traveled through France, Belgium and Germany providing artillery support for the advancing allied troops. Sam was also there with the 18th to secure the Rhine crossing for General Patton. Never one to sit still Sam had much more of the world to see and so he went on to Korea and eventually retired as a Master Sergeant at 84 Sam has slowed down a little bit but he is still very sharp and he will be providing us with more pictures and some interesting history of the 18th. Sam graded the artillery units at Iron Mountain California for efficiency training before they were sent to Europe for the D-Day invasion of WWII. Right -Sam is standing guard in front of 104,000 German POWs. Left - Sam is at home holding shirt that shows A Battery 3/18 Artillery 1st Section on fire mission, December '65. Above - Sam, and two others, with the only barber poll in Korea. 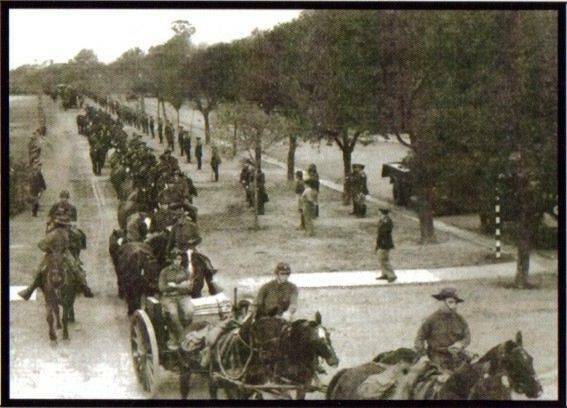 Sam and Ralph Lawson served together in the Ft. Sam to Ft. Sill horse transfer mission of 1938. 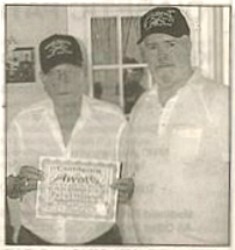 World War II veteran Sam McDaniel (left) of Valliant became an honorary member in the 3-18th Artillery Battalion Historical Society recently. Presenting Mr. McDaniel his membership award is Charles Martin, president of the Society. 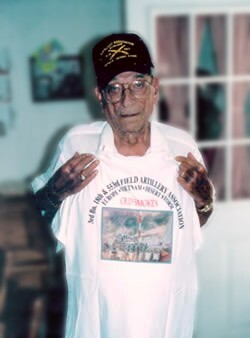 McDaniel, the oldest member of the Society, entered the U.S. Army in 1938 and was assigned to the 3-18th Artillery at Fort Sill. The 3-18th was the first Artillery Battalion to enter Europe during World War II, entering the fray at Omaha Beach, France. Sam and his fellow battalion members traveled through France, Belgium and into Germany, providing artillery support for the advancing troops. Martin said he was extremely please to meet Mr. McDaniel and include the Valiant veteran in the Historical Society, as Sam was able to provide extensive details on the 3-18th's role in winning World War II. * Taken from Valliant, Oklahoma publication. A few weeks after D-Day Invasion Sam's unit had 4 Howitzers hidden in a Tin Building at Euachinville, Germany. Patton had him pull them out and cut a hedge row (road) - when Sam got through, Gen. Patton was 40 miles away with his tanks. For reasons unknown, Patton took 40 POW's from the camp - Sam is still mad at Patton for stealing 40 of his POW's.